It is both with great happiness and some sadness that we said goodbye to these beauties recently. They have moved on from our inventory to their new forever homes but we wanted to preserve their images as they are some of our favorites. This magnificent oval sapphire engagement ring is centered with a 1.89 carat natural blue sapphire. 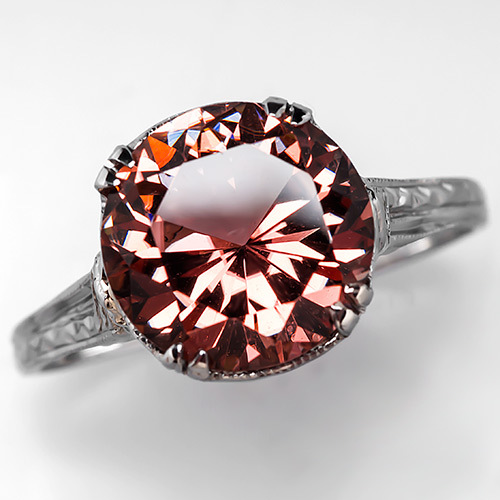 Accenting the sapphire are two rose cut diamonds and a halo of round brilliant cut diamonds. 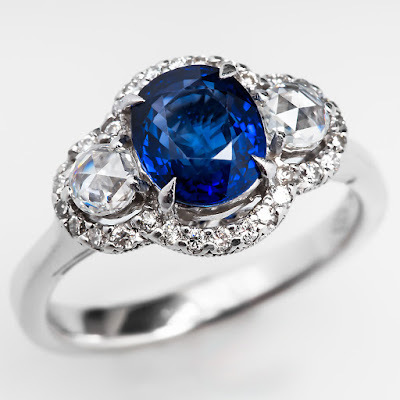 The sapphire's color is phenomenal and the rose cut diamonds give a perfect unique touch. The ring is crafted of solid 18k white gold and is finished with milgrain details. The sapphire shows extremely light wear, but the wear is not noticeable without magnification. The ring is in very good overall condition and will arrive with a fresh polish looking superb for your engagement. 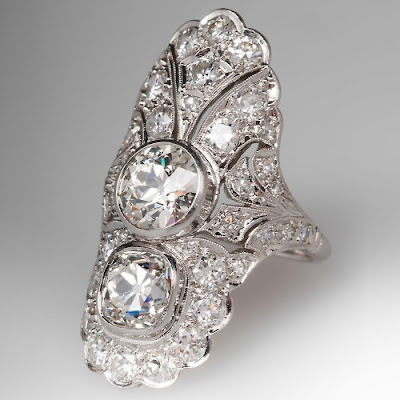 This gorgeous antique filigree ring dates from the 1930's and is set with a .67 carat old european cut diamond grading G in color and SI2 in clarity. The diamond has an amazing sparkle. The setting features lovely filigree openwork and a wonderful unique design. 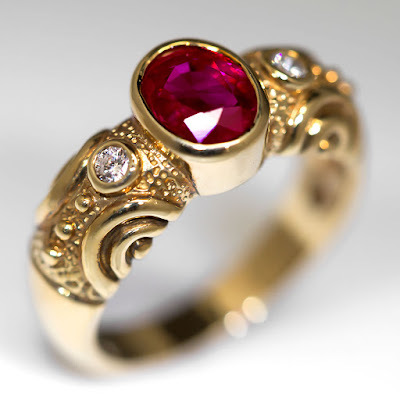 This lovely Etruscan style ruby ring is bezel set with a 1.29 carat oval cut red ruby. The ruby sits in a high bezel between two domed and textured shoulders. The juxtaposition of the high polished gold next to the darker textured gold really gives this ring a lot of interest. Each shoulder is accented with a bezel set round brilliant cut diamond. The ring is crafted of solid 18k yellow gold and is in very good condition with a nice natural patina. 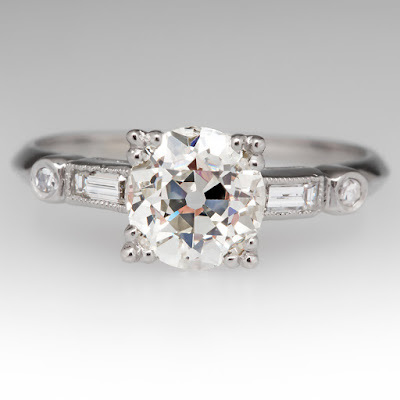 This perfect vintage diamond engagement ring features an heirloom old European cut diamond and a 1950's mounting with single cut diamonds and great details. 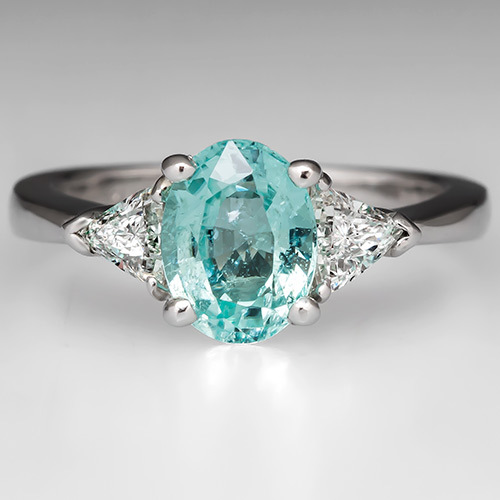 The center stone is just shy of a carat and the ring is in overall great condition. 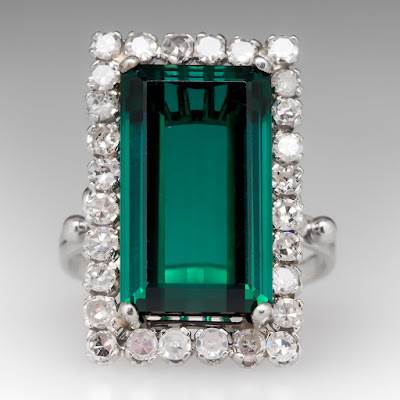 This vintage cocktail ring is centered with a gorgeous emerald cut tourmaline gemstone with incredible vibrant blue-green color. The tourmaline is surrounded by 28 single cut diamonds, looking like a sparkling frame around a stone that you could get lost in. The ring is crafted of 14k white gold and while having a nice presence on the finger it also has a nice low profile. 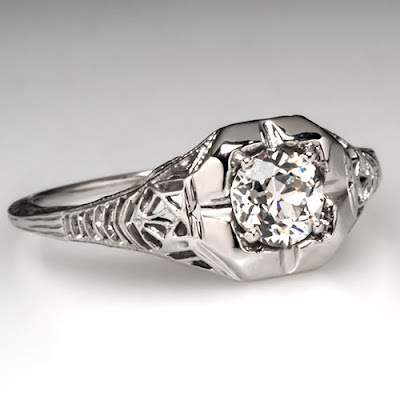 This is a perfect antique diamond engagement ring crafted of platinum featuring an Old European cut diamond and baguette and single cut diamond accents and is likely from the late 1930s however we were not able to confirm its age. As you can tell from the first sentence we can run on and on about this one but looking at the pictures is better than reading the words. This stunning sapphire engagement ring, fashioned entirely of solid 18k white gold, features diamond-encrusted shoulders set channel style. The wedding band is notched to fit snugly against the engagement ring. Central to the engagement ring is a high-quality 1.15-carat natural blue sapphire set within a diamond-studded halo. 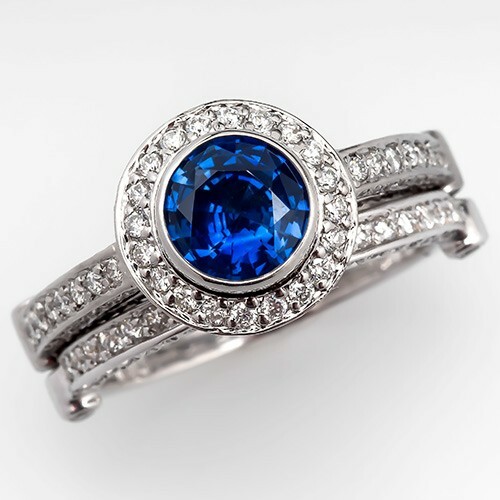 The sapphire is housed in a beautiful 18k white gold rub-over setting. Rub-over settings are another name for bezel settings, and they are the premiere setting for security of a stone. With so much metal holding a stone in place, it is unlikely that daily wear will loosen the stone. Rub-over settings are fashioned out of fairly soft metals, including yellow gold or silver. While the rub-over setting is suitable for any kind of gemstones, including faceted stones, it has most often been used for cabochons. These lend themselves most easily to rub-over settings since they are typically flattened on the back side and rounded in shape. While a stone set bezel-style may lose some access to the light, there are many advantages to rub-over settings. The first is the security of the stone. As mentioned before, once a stone is set in a bezel it would take a pry bar to pull it out. Second, they are easier to wear and keep clean. Without any prongs or distinct edges to snag your clothes, they make for smooth and easy wearing. Also, they are easy to polish with a soft cloth, keeping them shiny and brilliant even without routine care by a jeweler. In addition, the framing of a rub-over setting creates an illusion that the stone is actually larger than it is. This is especially true when a white diamond is set bezel style in platinum or white gold. The radiance of the metal and the diamond combine to provide maximum shimmer. The rub-over setting is an ancient style. There was a time when almost all jewels were set in bezel settings. That being said, there is nearly nothing more modern than a bezel-set jewel. There is something timeless about the elegant framing provided by a rub-over setting, a special quality that defies the ages. Many modern styles include bezels, including this stunning blue sapphire bridal set. If you'd like to purchase a timeless engagement ring for your bride-to-be, then we invite you to come in and take a look at our collection of bezel-style engagement rings. We look forward to hearing from you. If it weren't for tradition and advertising our guess is that many more brides to be would prefer to have some color in their engagement ring. Tourmaline Rings come in nearly every color of the rainbow and tourmaline is also one of the traditional Birthstones of October. 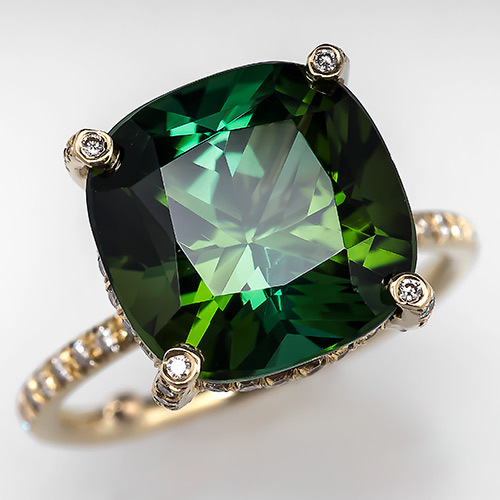 As stated above, tourmaline jewelry comes in nearly every desirable color and is generally available in its natural form, no treatments such as heating are normally necessary. It is sometimes heated or irradiated. Tourmaline is relatively durable and has a Mohs scale hardness of 7.0-7.5. 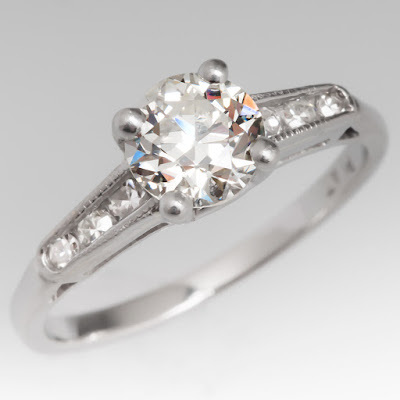 In smaller sized stones, being fairly tough, it makes for a fine choice for an engagement ring that can be worn daily. 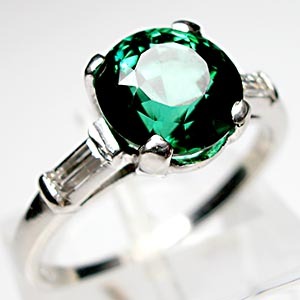 The green color of the chrome tourmaline jewelry is captivating and often features deeper color and better clarity and durability than emerald. 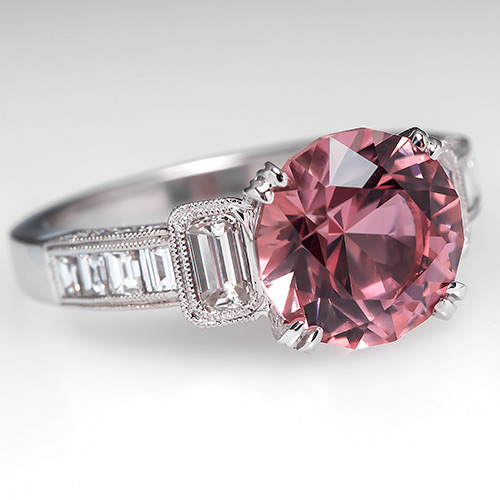 Pink colored tourmalines are also very desirable and beautiful. 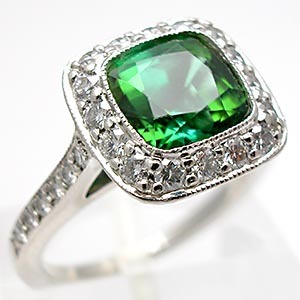 Tourmalines often have very good clarity even in larger sizes but are still affordable relative to the other precious gemstones that feature similar colors. 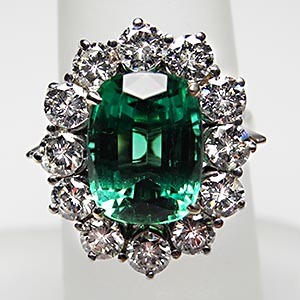 Jewelry designers like working with tourmaline to add color to their classic designs like the above ring from Vera Wang and the Tiffany & Co Legacy Collection tourmaline ring pictured below. 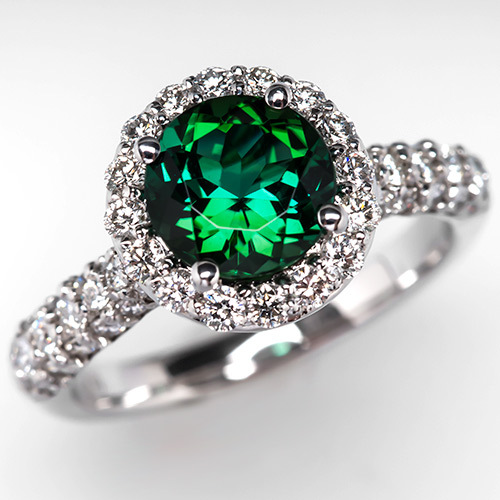 EraGem features a wide range of tourmaline engagement ring options. 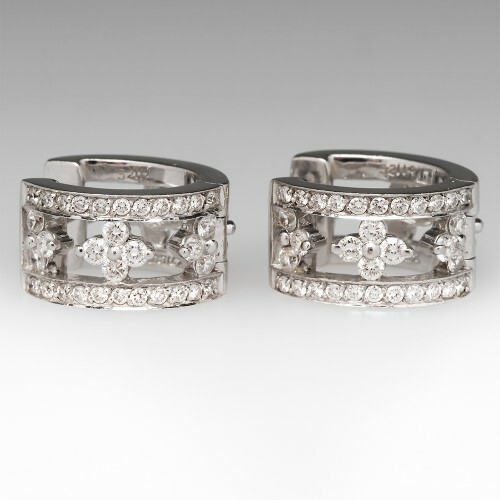 Our collection are primarily estate vintage pieces and as well as pre-owned modern and designer rings. Please enjoy a few more pictures of natural tourmaline rings that customers of EraGem are currently enjoying . Crafted of solid 18k white gold, featuring high-quality round brilliant diamonds totaling over 1 full carat and designed in huggie earring style, these gorgeous Kwiat jewels hail from the reputable design firm's Jasmine Collection. Kwiat is revered for its exquisite haute couture designs. Catering to black tie and red carpet affairs, every Kwiat jewel is sophisticated in style and exquisite in design. Their jewelry has a timeless elegance, which ensures that even as time passes their artistry will remain chic and stylish. Their collections are airy and feminine, inspired by architecture, textiles, and nature's most beautiful flowers. The Kwiat name is backed by four generations of skilled jewelers. Sam Kwiat began his career in 1907, as a diamond trader on Canal Street in Manhattan. He specialized in refinishing older stones to enhance their brilliance. His passion for diamonds was contagious, sparking an interest in his son David who joined the firm in 1933 at the age of 17. David brought art into the business of diamonds, and Kwiat began designing and manufacturing intricate settings for their diamonds. In the 1960s and 1970s, David's sons Sheldon and Lowell joined the family firm, starting as apprentices to master craftsmen at the bench. Their diamonds and designs became the notable collections of such diamantaires as Harry Winston. Then in 2001, Sheldon and Lowell encouraged their forebears to launch their own brand. This led to exclusive Kwiat collections, designed primarily by Janice DeBell, formerly of Tiffany & Co. Their latest designs have strolled the red carpet with such Hollywood mavens as Sharon Stone and Halle Berry. Kwiat has rightfully earned its prestigious position with their impeccable craftsmanship and attention to detail, with their high standards of excellence, and with their reputation for integrity, loyalty, and commitment to their customers. Kwiat's business and design philosophy are one in the same: Answer only to the customer. The Kwiat family believes that every uncut diamond needs a craftsman to release its brilliance, and every brilliant diamond needs an event to share its significance. To ensure that they meet their own demanding standards, as well as the expectations of their customers, Kwiat focuses all of its attention on craftsmanship; always learning, always refining, always redefining. Then, they pass that knowledge on to their clients, sharing everything they've learned so that those who wear their jewels understand the exquisite value they add to their wearers. Both the Kwiat diamond and the woman who wears it are celebrated, ensuring that every diamond is properly balanced in cut and design. In addition, Kwiat guarantees that its diamonds are ethically sourced and conflict-free, drawing from mining operations in Russia, South Africa, Botswana, Namibia, and Canada. With the Kwiat name comes a guarantee of beauty and quality. Do you find your solace amid lush stands of tall deciduous trees lining lazy rolling rivers and big sky clouds? Do you long for an adventure in diamond country? If so, then might we recommend a honeymoon trip to Crater of Diamonds State Park in Murfreesboro, Arkansas? Arkansas may not be the first place you'd think of when you think of romance, but diamonds most certainly should be! Did we mention that in Arkansas you can hunt for your own diamonds in the only publicly accessible diamond mine in the world? Well, you can! And several people have found genuine diamonds at Crater of Diamonds, a few of them fairly sizable. 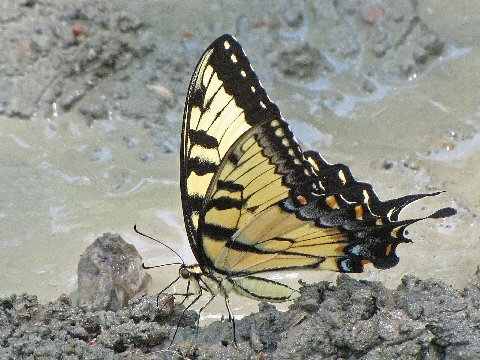 The 900-acre park stretches along the Little Missouri River and features interpretive programs, diamond hunting education, a water park, and miles of hiking trails. The park is the result of a marketing strategy that worked brilliantly for miner Howard A. Millar. In 1952, Millar aggressively promoted his diamond mine, inviting people from all over to come and find treasure in his diamond field. A geologist by trade, Millar gave lectures and classified the diamonds found by his mine's visitors. Eventually, a museum, gift shop, and restaurant were opened on site, and the Crater of Diamonds was born. Throughout the '50s and '60s, visitors to the mine found thousands of diamonds that they took home as souvenirs. In 1972, the mine was purchased by the State of Arkansas. It continues to run as a State Park to this day. The park is beautiful and inspiring in so many ways, although the least inspiring place, called the Pig Pen, is the only place on the grounds where diamonds can be found. The Pig Pen is a wide open, 37-acre mud field rich in volcanic kimberlite soil. Here, beneath the broad open sky, visitors to the park hunt dig their hands, with shovels, or with picks and screens to find the yellow, brown, and white diamonds that are harvested from the old volcanic pipe. In addition to diamonds, rockhounds can find treasure in the form of garnet, amethyst, jasper, and other quartz and agate stones. All of these can be brought to the Diamond Discovery Center for identification and registration (for diamonds only). You get to keep what you find, and the cost is nothing more than park admission. If you decide to honeymoon in Arkansas, then may we also recommend a stay at the nearby Diamonds Cabins? Diamonds Cabins offers an inclusive Old West experience that begins with a stay in Crazy Diamonds Saloon. The Saloon is an upstairs suite which features a one-of-a-kind western king-size bed outfitted with memory foam and Egyptian cotton sheets. The upstairs windows overlook a panoramic view of the mountains. A two-person jacuzzi/hot tub is surrounded by mirrors, and a private deck offers outdoor romance at any time, day or night. The room also includes the use of a fire pit, a grill, and picnic tables for enjoying the great outdoors. If you get tired of lounging in your suite, you can take a stroll into the Old West. Begin with a visit to the General Store. At the General Store you can purchase old-fashioned penny candies, locally made goat's milk beauty products, locally sourced geodes, and any cookout supplies you might need. If you're in the mood for some playful fun, then take yourself on a child's adventure at the Horse Trot Pedal Car Track, the sudsy Foam Party, and the Corn Pit! You know you want to suds each other up and take a roll in the corn!! And if your hunt in the Pig Pen yielded less than satisfactory results, then try your hand at the Old West Sluice Box. Every gem bag contains crystals, arrowheads, fools gold, pirate coins, shark teeth, agates, fossils, geodes, native jewelry, and more. If you love the Old West and good, clean (okay, maybe muddy, sudsy, and corny) fun, then we cannot more highly recommend a honeymoon at Crater of Diamonds State Park!